Try a class for free! (New students only). Note: Baby Bop! Music session dates differ from those of dance classes. Please check the Baby Bop! Music schedule for session dates. ​DWMR now conveniently sells everything you need for your first day of class! Stop by the studio to choose from our selection of leotards, skirted leotards, tights and shoes! At DWMR we like to let our dancers' creativity shine! We ask our ballerinas to dress in a leotard, tights, skirt, and ballet shoes. Any color or style is acceptable. For our tiniest ballerinas who may not have ballet shoes just yet, socks are acceptable. (Socks with grips are even better!). Boys are asked to wear a t-shirt or tank top and comfortable pants. Ballet or jazz shoes are required. Our Tutu Tap dancers should dress as they would for a ballet class. Tutu Tap dancers should bring ballet AND tap shoes to class each week. 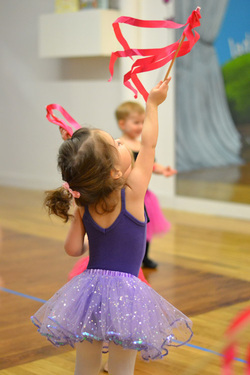 Our Tutu Tap dancers should dress as they would for a ballet class (leotard, tights, skirt, and ballet shoes in any color or style for girls, t-shirt or tank top and comfortable pants for boys; socks or socks with grips are fine for our tiniest dancers who may not have ballet shoes just yet). Tutu Tap dancers should bring ballet shoes AND tap shoes to class each week. ​Leave your ballet skirt at home! Dancers are asked to dress in a leotard, leggings or shorts. Jazz/ballet shoes and tap shoes required. Boppers are asked to wear anything they are comfortable Bopping in! Socks are requited for Boppers and caregivers. ​For Fall, Winter/Spring, and Summer classes and programs, a $100 non-refundable deposit will be charged at the time of enrollment, with any remaining balance due charged the first week of classes. (This does not apply for special events). A one-time, complimentary trial class is offered for all new students. Please note this is only offered for students new to DWMR. Please submit a request or call ahead of time to set up a trial. NOTE: There are no trial classes for spring or summer short programs. 3 makeup classes are allowed per semester for missed classes during Fall/Winter/Spring sessions. Makeups do not carry over from session to session and must be used during the same session in which student is enrolled. 2 makeup classes are allowed in Summer and Baby Bop! music classes (note exceptions for weeks falling over holidays--﻿see Summer Policies for more info﻿). Makeups may be taken in any other, non-wait-listed, age-appropriate class, pending instructor approval. Due to recital preparation, no makeup classes will be permitted in the month of June. NOTE: makeups cannot be cancelled or changed within 24 hours of the makeup class. If you miss your makeup, you will not be able to reschedule. There are no make ups or trials during spring or summer short programs, and no make up classes for holidays, weather closures, or other instances in which classes do not take place. Students enrolled in Fall dance classes (not including Baby Bop!) will automatically be re-enrolled into their same classes in the Winter/Spring Session unless they opt out, in order to guarantee their spot(s) in the Winter/Spring Session. No less than two (2) notices will be sent to enrolled students via email reminding them of this rollover and providing opportunity to opt-out of Winter/Spring classes. Should students not opt out by the provided deadline, they will be re-enrolled and their credit card on file will be charged for the published rate of the Winter/Spring Session. Should student withdraw from the Winter/Spring session after the provided deadline, a $100 deposit fee will be subtracted from their refund. Dance with Miss Rachel (including its staff and teachers) is not responsible for lost or stolen items at the studio, its facilities, or other locations used for studio functions such as recital venues or party locations. All dancers enrolled in Winter/Spring session will have the opportunity to participate in our year-end recital held in the spring each year. An additional recital fee will be charged in order to participate. Please note, recital fees are non-refundable. After you are enrolled in a class, you will be able to register for and use the Customer Portal. You will create a Customer Portal account by entering the email address you provided at registration and clicking the button that says, “Reset Password”. A temporary password will then be emailed to you to be used to login to your account. From there, you may change your password -- be sure it has a minimum of 8 characters, 1 of which must be a number. If you experience any issues logging in, please contact us at info@dancewithmissrachel.com. Dance with Miss Rachel may use photographs and/or video that includes our students in promotional / advertising / website materials. If you prefer your student NOT be included, please let us know by contacting us at info@dancewithmissrachel.com and we will make a note of your preference. With the exception of your dancer’s solo, video recording is prohibited during classes.